To manage employee relations the right way, you need to see the bigger picture. Equip yourself with the data to discover patterns, identify trends, and proactively manage risk. Spot trends, patterns, and recurring problems with individual employees or teams. Use our built-in reports to address the real reasons behind issues related to culture, policy, leadership, and more. Measure how your organization stacks up against others. Our benchmarking dashboard helps uncover weak spots, so you can find ways to improve. Mitigate legal and financial risk by analyzing and managing issues before they escalate. Guard against regulatory violations with access to accurate, detailed reports at a moment's notice. 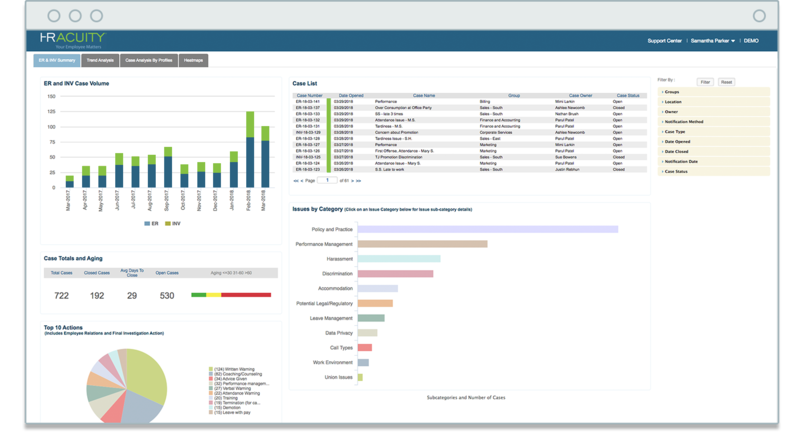 Analyze your data according to demographics, issue type, individual employee, department, and more. Basic and advanced search capabilities highlight patterns of behavior and help manage recurring issues. Analyze your data for the most common discrepancies, gaps, and overlaps with a choice of over 50 standard reports. Publish, schedule, share, and save reports in a variety of formats, including PDF, Excel, CSV, and RTF. We built our software with your employee relations process in mind. Take a deep dive and learn why HR Acuity is the leading employee relations case management solution.